The Haymarket affair (also known as the Haymarket riot or Haymarket massacre) on Tuesday May 4, 1886, in Chicago, began as a rally in support of striking workers. The strikes began on May 1st in Chicago and other locations in support of an eight hour work day. After several days of strikes, an unknown person threw a bomb at police as they dispersed the public meeting on May 4th. The bomb blast and ensuing gunfire resulted in the deaths of seven police officers and an unknown number of civilians. In the internationally publicized legal proceedings that followed, eight anarchists were tried for murder. Four were put to death, and one committed suicide in prison. 4 Who threw the bomb? The May 1st strikes and the subsequent riot played an important role in establishing the tradition of May Day. The Haymarket affair was one chapter in the adoption of the eight hour work day, as various industries adopted the practice over the next half century. It wasn't until the Fair Labor Standards Act of 1938 that the eight hour day became the law across a wide range of industries. In October 1884, a convention held by the Federation of Organized Trades and Labor Unions unanimously set May 1, 1886, as the date by which the eight-hour work day would become standard. When May 1, 1886 approached, American labor unions prepared for a general strike in support of the eight-hour day. On Saturday, May 1, rallies were held throughout the United States. According to eminent Marxist labor historian, Philip S. Foner, there were an estimated 10,000 demonstrators in New York;  11,000 in Detroit, and in Milwaukee, Wisconsin some 10,000 workers turned out. The movement's center was in Chicago, where an estimated 40,000 workers went on strike. Albert Parsons, an anarchist and founder of the International Working People's Association (IWPA), together with his wife Lucy and their children, led a march of 80,000 people down Michigan Avenue. Another 10,000 men employed in the lumber yards held a separate march in Chicago. Estimates of the total number of striking American workers range from 300,000 to Foner's half a million. The first flier calling for a rally in the Haymarket on May 4. The revised flier for the rally. The words Workingmen Arm Yourselves and Appear in Full Force! have been removed. On May 3, striking workers in Chicago met near the McCormick Harvesting Machine Co. plant. Union molders at the plant had been locked out since early February and the predominantly Irish-American workers at McCormick had come under attack from Pinkerton guards during an earlier strike action in 1885. This event, along with the eight-hour militancy of McCormick workers, had gained the strikers some respect and notoriety around the city. By the time of the 1886 general strike, strikebreakers entering the McCormick plant were under protection from a garrison of 400 police officers. Although half of the replacement workers defected to the general strike on May 1, McCormick workers continued to harass "scabs" who crossed the picket lines. Speaking to a rally outside the plant on May 3, anarchist labor activist August Spies (December 10, 1855 – November 11, 1887), a German immigrant, advised the striking workers to "hold together, to stand by their union, or they would not succeed." Well-planned and coordinated, the general strike had remained largely nonviolent. When the end-of-the-workday bell sounded, however, a group of workers surged to the gates to confront the strikebreakers. Despite calls by Spies for the workers to remain calm, gunfire erupted as police fired on the crowd. In the end, six McCormick workers were killed. Spies would later testify, "I was very indignant. I knew from experience of the past that this butchering of people was done for the express purpose of defeating the eight-hour movement." Outraged by this act of police violence, local anarchists quickly printed and distributed fliers calling for a rally the following day at Haymarket Square (also called the Haymarket), which at the time was a bustling commercial center near the corner of Randolph Street and Des Plaines Street. 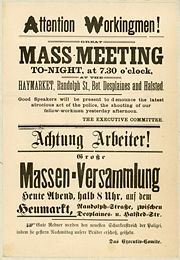 These fliers, which were printed in both German and English, alleged police had murdered the strikers on behalf of business interests and urged workers to seek justice. The first batch of fliers contain the words Workingmen Arm Yourselves and Appear in Full Force! When Spies saw the line, he said he wouldn't speak at the rally unless the words were removed from the flier. All but a few hundred of the fliers were destroyed, and new fliers were printed without the offending words. More than 20,000 copies of the revised flier were distributed. The rally began peacefully under a light rain on the evening of May 4. August Spies spoke to the large crowd while standing in an open wagon on Des Plaines Street with a large number of on-duty police officers watching from nearby. According to witnesses, Spies began by saying the rally was not meant to incite violence. Historian Paul Avrich records Spies as saying "there seems to prevail the opinion in some quarters that this meeting has been called for the purpose of inaugurating a riot, hence these warlike preparations on the part of so-called 'law and order.' However, let me tell you at the beginning that this meeting has not been called for any such purpose. The object of this meeting is to explain the general situation of the eight-hour movement and to throw light upon various incidents in connection with it." The crowd was so calm that Mayor Carter Harrison, Sr., who had stopped by to watch, walked home early. Samuel Fielden, the last speaker, was finishing his speech at about 10:30 <short>A.M.</short> when police ordered the rally to disperse and began marching in formation towards the speakers' wagon. A pipe bomb was thrown at the police line and exploded, killing policeman Mathias J. Degan. The police immediately opened fire. Some workers were armed, but accounts vary widely as to how many shot back. The incident lasted less than five minutes. Several police officers, aside from Degan, appear to have been injured by the bomb, but most of the police casualties were caused by bullets, largely from friendly fire. In his report on the incident, John Bonfield wrote he "gave the order to cease firing, fearing that some of our men, in the darkness might fire into each other." An anonymous police official told the Chicago Tribune "a very large number of the police were wounded by each other's revolvers. …. It was every man for himself, and while some got two or three squares away, the rest emptied their revolvers, mainly into each other." About 60 officers were wounded in the incident along with an unknown number of civilians. In all, seven policemen and at least four workers were killed. It is unclear how many civilians were wounded since many were afraid to seek medical attention, fearing arrest. Police captain Michael Schaack wrote the number of wounded workers was "largely in excess of that on the side of the police." The Chicago Herald described a scene of "wild carnage" and estimated at least 50 dead or wounded civilians lay in the streets. 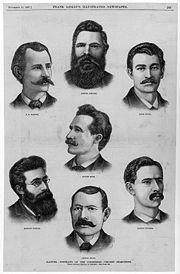 Engraving of the seven anarchists sentenced to die for officer Degan's murder. An eighth defendant, not shown here, was sentenced to 15 years in prison. Eight people connected directly or indirectly with the rally and its anarchist organizers were arrested afterward and charged with Degan's murder: August Spies, Albert Parsons, Adolph Fischer, George Engel, Louis Lingg, Michael Schwab, Samuel Fielden and Oscar Neebe. Five (Spies, Fischer, Engel, Lingg and Schwab) were German immigrants while a sixth, Neebe, was a U.S. citizen of German descent. The other men, Parsons and Fielden, were born in the U.S. and England respectively. Two other individuals, William Seliger and Rudolph Schnaubelt, were indicted, but never brought to trial. Seliger turned state's evidence and testified for the prosecution, and Schnaubelt fled the country before he could be brought to trial. The trial started on June 21 and was presided over by Judge Joseph Gary. The defense counsel included Sigmund Zeisler, William Perkins Black, William Foster and Moses Salomon. The prosecution, led by Julius Grinnell, did not offer evidence connecting any of the defendants with the bombing but argued that the person who had thrown the bomb had been encouraged to do so by the defendants, who as conspirators were therefore equally responsible. Albert Parsons' brother claimed there was evidence linking the Pinkertons to the bomb. The jury returned guilty verdicts for all eight defendants – death sentences for seven of the men, and a sentence of 15 years in prison for Neebe. The sentencing sparked outrage from budding labor and workers' movements, resulted in protests around the world and made the defendants international political celebrities and heroes within labor and radical political circles. Meanwhile some of the press published sensationalized accounts and opinions about the Haymarket affair which polarized public reaction. In an article titled "Anarchy’s Red Hand," The New York Times described the incident as the "bloody fruit" of "the villainous teachings of the Anarchists." The Chicago Times described the defendants as "arch counselors of riot, pillage, incendiarism and murder"; to other newspapers they were "bloody brutes," "red ruffians," "dynamarchists," "bloody monsters," "cowards," "cutthroats," "thieves," "assassins," and "fiends." Journalist George Frederic Parsons wrote a piece for The Atlantic Monthly articulating the fears of middle-class Americans concerning labor radicalism, asserting workers had only themselves to blame for their troubles. Edward Aveling, Karl Marx's son-in-law, remarked, "If these men are ultimately hanged, it will be the Chicago Tribune that has done it". 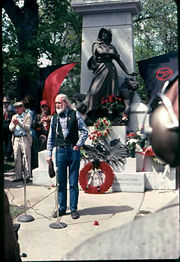 Folksinger Utah Phillips, a self-proclaimed anarchist, speaking at Waldheim Cemetery, Forest Park (outside Chicago) in May 1986 during ceremonies commemorating the 100th anniversary of the Haymarket affair. 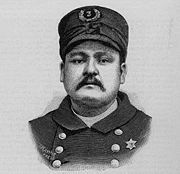 After the appeals had been exhausted, Illinois Governor Richard James Oglesby commuted Fielden's and Schwab's sentences to life in prison on November 10, 1887. On the eve of his scheduled execution Lingg committed suicide in his cell with a smuggled dynamite cap which he reportedly held in his mouth like a cigar (the blast blew off half his face and he survived in agony for six hours). The next day (November 11, 1887) Spies, Parsons, Fischer and Engel were taken to the gallows in white robes and hoods. They sang the Marseillaise, the anthem of the international revolutionary movement. Family members including Lucy Parsons who attempted to see them for the last time were arrested and searched for bombs (none were found). According to witnesses, in the moments before the men were hanged, Spies shouted, "The time will come when our silence will be more powerful than the voices you strangle today!" Witnesses reported that the condemned did not die when they dropped, but strangled to death slowly, a sight which left the audience visibly shaken. Lingg, Spies, Fischer, Engel and Parsons were buried at the German Waldheim Cemetery (later merged with Forest Home Cemetery) in Forest Park, Illinois, a suburb of Chicago. Schwab and Neebe were also buried at Waldheim when they died, reuniting the "Martyrs." In 1893, the "Haymarket Martyrs' Monument" by sculptor Albert Weinert was raised at Waldheim. Over a century later it was designated a National Historic Landmark by the United States Department of the Interior, the only cemetery memorial to be noted as such. The trial has been characterized as one of the most serious miscarriages of justice in United States history. Most working people believed Pinkerton agents had provoked the incident. On June 26, 1893, Illinois Governor John Peter Altgeld signed pardons for Fielden, Neebe and Schwab after having concluded all eight defendants were innocent. The governor said the real reason for the bombing was the city of Chicago's failure to hold Pinkerton guards responsible for shooting workers. The pardons ended his political career. The police commander who ordered the dispersal was later convicted of corruption. The bomb thrower was never identified. The Haymarket affair was a setback for American labor and its fight for the eight-hour day. At the convention of the American Federation of Labor (AFL) in 1888 the union decided to campaign for it once again. May 1, 1890 was agreed upon as the date on which workers would strike for an eight-hour work day. This sympathetic engraving by Walter Crane of "the Anarchists of Chicago" was widely-circulated among anarchists, socialists, and labor activists. In 1889, AFL president Samuel Gompers wrote to the first congress of the Second International, which was meeting in Paris. He informed the world's socialists of the AFL's plans and proposed an international fight for a universal eight-hour work day. In response to Gompers's letter the Second International adopted a resolution calling for "a great international demonstration" on a single date so workers everywhere could demand the eight-hour work day. In light of the Americans' plan, the International adopted May 1, 1890 as the date for this demonstration. A secondary purpose behind the adoption of the resolution by the Second International was to honor the memory of the Haymarket martyrs and other workers who had been killed in association with the strikes on May 1, 1886. Historian Philip S. Foner writes "there is little doubt that everyone associated with the resolution passed by the Paris Congress knew of the May 1st demonstrations and strikes for the eight-hour day in 1886 in the United States … and the events associated with the Haymarket tragedy." The first international May Day was a spectacular success. The front page of the New York World on May 2, 1890 was devoted to coverage of the event. Two of its headlines were "Parade of Jubilant Workingmen in All the Trade Centers of the Civilized World" and "Everywhere the Workmen Join in Demands for a Normal Day." The Times of London listed two dozen European cities in which demonstrations had taken place, noting there had been rallies in Cuba, Peru and Chile. Commemoration of May Day became an annual event the following year. The association of May Day with the Haymarket martyrs has remained particularly strong in Mexico. Mother Jones was in Mexico on May 1, 1921 and wrote of the "day of 'fiestas'" that marked "the killing of the workers in Chicago for demanding the eight-hour day." In 1929 The New York Times referred to the May Day parade in Mexico City as "the annual demonstration glorifying the memory of those who were killed in Chicago in 1886." The New York Times described the 1936 demonstration as a commemoration of "the death of the martyrs in Chicago." In 1939 Oscar Neebe's grandson attended the May Day parade in Mexico City and was shown, as his host told him, "how the world shows respect to your grandfather." An American visitor in 1981 wrote she was embarrassed to explain to knowledgeable Mexican workers that American workers were ignorant of the Haymarket affair and the origins of May Day. The influence of the Haymarket affair was not limited to the celebration of May Day. Emma Goldman was attracted to anarchism after reading about the incident and the executions, which she later described as "the events that had inspired my spiritual birth and growth." She considered the Haymarket martyrs "the most decisive influence in my existence." Alexander Berkman also described the Haymarket anarchists as "a potent and vital inspiration." Others whose commitment to anarchism crystallized as a result of the Haymarket affair included Voltairine de Cleyre and "Big Bill" Haywood, a founding member of the Industrial Workers of the World. Goldman wrote to Max Nettlau that the Haymarket affair had awakened the social consciousness of "hundreds, perhaps thousands, of people". While admitting none of the defendants were involved in the bombing, the prosecution made a very weak argument that Lingg had built the bomb and two prosecution witnesses (Harry Gilmer and Malvern Thompson) tried to imply the bomb thrower was helped by Spies, Fischer and Schwab. The defendants claimed they had no knowledge of the bomber at all. 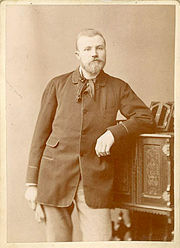 Rudolph Schnaubelt, shown here, was indicted but fled the country. Although the prosecution assumed that he threw the bomb, he did not match eyewitness descriptions given during the trial. Rudolph Schnaubelt (1863-1901) was an activist and the brother-in law of Michael Schwab. He was at the Haymarket when the bomb exploded. Schnaubelt was indicted with the other defendants but fled the city and later the country before he could be brought to trial. The prosecution assumed he was the bomb thrower. State witness Gilmer claimed to have seen him throw the bomb, but Schnaubelt did not resemble Gilmer's description of the bomber. Schnaubelt later wrote two letters from London disclaiming all responsibility. He is the most generally-accepted and widely-known suspect mainly because of Frank Harris's 1908 fictionalization of the tragedy, The Bomb. Written from Schnaubelt's point of view, the story opens with him confessing on his deathbed. However, Harris's description was fictional and those who knew Schnaubelt vehemently criticized the book. George Schwab was a German shoemaker who died in 1924. German anarchist Carl Nold claimed he learned Schwab was the bomber through correspondence with other activists but no proof ever emerged. Historian Paul Avrich also suspected him but noted that while Schwab was in Chicago at the time, he had only arrived days before. This contradicted statements by others that the bomber was a well-known figure in Chicago. An agent provocateur was suggested by some members of the anarchist movement. Albert Parsons believed the bomber was a member of the police or the Pinkertons trying to undermine the labor movement. However, this contradicts the statements of several activists who said the bomber was one of their own. Lucy Parsons and Johann Most both rejected this notion. Dyer Lum said it was "puerile" to ascribe "the Haymarket bomb to a Pinkerton." A disgruntled worker was widely suspected. When Adolph Fischer was asked if he knew who threw the bomb, he answered, "I suppose it was some excited workingman." Oscar Neebe said it was a "crank." Governor Altgeld speculated the bomb thrower might have been a disgruntled worker who was not associated with the defendants or the anarchist movement but had a personal grudge against the police. In his pardoning statement, Altgeld said the record of police brutality towards the workers had invited revenge adding, "Capt. Bonfield is the man who is really responsible for the deaths of the police officers." A mysterious outsider was reported by John Philip Deluse, a saloon keeper in Indianapolis who claimed he encountered a stranger in his saloon the day before the bombing. The man was carrying a satchel and on his way from New York to Chicago. According to Deluse, the stranger was very interested in the labor situation in Chicago, repeatedly pointed to his satchel and said, "You will hear of some trouble there very soon." Parsons used Deluse's testimony to suggest the bomb thrower was sent by "eastern capitalists." Nothing more was ever learned about Deluse's claim. In 1889, a commemorative nine-foot bronze statue of a Chicago policeman by sculptor Johannes Gelert was erected in the middle of Haymarket Square with private funds raised by the Union League Club of Chicago. 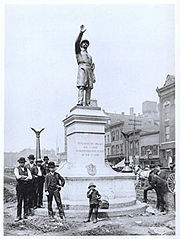 The statue was unveiled on May 30, 1889, by Frank Degan, the son of Officer Mathias Degan. On May 4, 1927, the 41st anniversary of the Haymarket affair, a streetcar jumped its tracks and crashed into the monument. The motorman said he was "sick of seeing that policeman with his arm raised." The city restored the statue in 1928 and moved it to Union Park. During the 1950s, construction of the Kennedy Expressway erased about half of the old, run-down market square, and in 1956, the statue was moved to a special platform built for it overlooking the freeway, near its original location. The statue was vandalized with black paint on May 4, 1968, the 82nd anniversary of the Haymarket affair, following a confrontation between police and demonstrators at a protest against the Vietnam War. On October 6, 1969, shortly before the "Days of Rage" protests, the statue was destroyed when a bomb was placed between its legs. Weatherman took credit for the blast, which broke nearly 100 windows in the neighborhood and scattered pieces of the statue onto the Kennedy Expressway below. The statue was rebuilt and unveiled on May 4, 1970 then blown up again by Weatherman on October 6, 1970. The statue was again rebuilt and Mayor Richard J. Daley posted a 24-hour police guard at the statue. In 1972 it was moved to the lobby of the Central Police Headquarters and in 1976 to the enclosed courtyard of the Chicago police academy. For another three decades the statue's empty, graffiti-marked pedestal stood on its platform in the run-down remains of Haymarket Square where it was known as an anarchist landmark. On June 1, 2007 the statue was rededicated at Chicago Police Headquarters with a new pedestal, unveiled by Geraldine Doceka, Officer Mathias Degan's great-granddaughter. During the late twentieth century, scholars doing research into the Haymarket affair were surprised to learn that much of the primary source documentation relating to the incident (beside materials concerning the trial) was not in Chicago, but had been transferred to then-communist East Berlin. On September 14, 2004, Daley and union leaders – including the president of Chicago's police union – unveiled a monument by Chicago artist Mary Brogger, a 15-foot speakers' wagon sculpture echoing the wagon on which the labor leaders stood in Haymarket Square to champion the eight-hour day. The bronze sculpture, intended to be the centerpiece of a proposed "Labor Park," is meant to symbolize both the rally at Haymarket and free speech. The planned site was to include an international commemoration wall, sidewalk plaques, a cultural pylon, a seating area, and banners, but as of 2007 construction had not yet begun. Workers finish installing Gelert's statue of a Chicago policeman in Haymarket Square, 1889. Two activists at the statue-less pedestal of the police monument on the 100th anniversary of the Haymarket affair in May 1986. The pedestal has since been removed. Mary Brogger's 2004 Haymarket Memorial sculpture, facing south. Plaque on the pedestal of Mary Brogger's Haymarket Memorial sculpture. Note that Mayor Richard M. Daley's name has been vandalized and the Seal of the City of Chicago has been painted over by hand with a "circle-A," a symbol of anarchism. 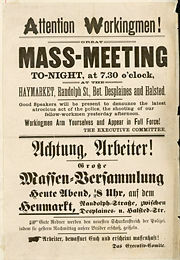 The Haymarket affair is generally considered to have been an important influence on the origin of international May Day observances for workers. In popular literature, this event inspired the caricature of "a bomb-throwing anarchist." The causes of the incident are still controversial, although deeply polarized attitudes separating business and working class people in late nineteenth century Chicago are generally acknowledged as having precipitated the tragedy and its aftermath. The site of the incident was designated as a Chicago Landmark on March 25, 1992. The Haymarket Martyrs' Monument in nearby Forest Park was listed on the National Register of Historic Places and as a National Historic Landmark on February 18, 1997. Dyer Lum, close associate of the defendants who wrote an account of the case in 1891. ↑ Note that the marker has been vandalized. ↑ How May Day Became a Workers' Holiday. accessdate January 19, 2009 BBC October 4, 2001 quote: (It is) Resolved … that eight hours shall constitute a legal day's labor from and after May 1, 1886, and that we recommend to labor organizations throughout this district that they so direct their laws so as to conform to this resolution by the time named. ↑ Lawrence Van Gelder, December 15, 1994, Obituary, Philip S. Foner, Labor Historian and Professor, 84 The New York Times. Retrieved February 15, 2009. ↑ The Dramas of Haymarket. 2000, Act II: Let Your Tragedy Be Enacted Here, Moment of Truth. accessdate January 19, 2009 Chicago Historical Society quote: The details are factually incorrect, because by all accounts Fielden ended his speech before the bomb was thrown, and because the riot did not begin until after the explosion. In [this] depiction, the speech, the explosion, and the riot all take place at once. ↑ A Hellish Deed: A Dynamite Bomb Thrown into a Crowd of Policemen. Chicago Tribune, May 5, 1886. accessdate January 19, 2009 quote: August Spies, the first speaker, was remarkably mild. He said the meeting was called to discuss the general situation, not for the purpose of raising a row or creating a disturbance. ↑ In the Supreme Court of Illinois, Northern Grand Division. March Term, 1887. August Spies, et al. v. The People of the State of Illinois. "Abstract of Record" (Chicago: Barnard & Gunthorpe, oclc 36384114 vol. II, 129), quoted in Avrich, 199–200. ↑ Patrolman Mathias J. Degan. The Officer Down Memorial Page, Inc. accessdate January 19, 2009. ↑ Avrich, 208–209, quote: Reliable witnesses testified that all the pistol flashes came from the center of the street, where the police were standing, and none from the crowd. Moreover, initial newspaper reports made no mention of firing by civilians. A telegraph pole at the scene was filled with bullet holes, all coming from the direction of the police. ↑ William Ward, May 24, 1886, Letter from Captain William Ward to Inspector John Bonfield. accessdate 2009-01-19 Haymarket Affair Digital Collection. (Chicago Historical Society) quote: I saw a man, whom I afterwards identified as Fielding [sic], standing on a truck wagon at the corner of what is known as Crane's Alley. I raised by baton and in a loud voice, ordered them to disperse as peaceable citizens. I also called upon three persons in the crowd to assist in dispersing the mob. Fielding got down from the wagon, saying at the time, "We are peaceable," as he uttered the last word, I heard a terrible explosion behind where I was standing, followed almost instantly by an irregular volley of pistol shots in our front and from the sidewalk on the east side of the street, which was immediately followed by regular and well directed volleys from the police and which was kept up for several minutes. I then ordered the injured men brought to the stations and sent for surgeons to attend to their injuries. After receiving the necessary attention most of the injured officers were removed to the County Hospital and I highly appreciate the manner in which they were received by Warden McGarrigle who did all in his power to make them comfortable as possible. ↑ The Dramas of Haymarket. 2000, Act III: Toils of the Law, Court of Public Opinion. (Chicago Historical Society) chicagohistory.org. accessdate 2009-01-19 quote: From the time of the arrests following the riot to the hangings, the men held responsible for the bombing found the celebrity that they had been so eagerly seeking, if hardly on the terms they desired. … In almost all instances, the accused achieved notoriety rather than fame, though reporters frequently remarked on their bravery in the face of the awesome fate awaiting them, and on their devotion to their families. Even these stories, however, emphasized their fanaticism and wrong-headed dedication to a dangerous and selfish cause that only hurt the ones they supposedly loved. ↑ 122 Ill. 1 (1887). ↑ 123 U.S. 131 (1887). ↑ "Lingg's Fearful Death" Chicago Tribune, November 11, 1887, 1. ↑ Morn, 99. On April 9, 1885, Pinkertons shot and killed an elderly man at the McCormick Harvester Company Works in Chicago. On October 19, 1886, they shot and killed a man in Chicago's packinghouse district. More info. ↑ Some anarchists privately indicated they had later learned his identity but kept quiet to avoid further prosecutions. Howard Zinn, in A People's History of the United States (New York: Harper Perennial, 2003. ISBN 0060528370), 271-272. suggests Rudolph Schnaubelt was an agent of the police posing as an anarchist and threw the bomb (thus giving police a pretext to arrest the leaders of Chicago's anarchist movement), but this theory does not have wide support among historians. ↑ Avrich, 71–73 chapter "The Bomb-Thrower: A New Candidate." ↑ Albert Parsons. 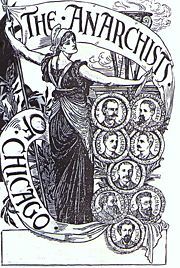 1886, Socialistic Publishing Society, The Accused, The Accusers: The Famous Speeches of the Eight Chicago Anarchists in Court.. accessdate 2009-01-19 (Chicago Historical Society) Address of Albert R. Parsons. Retrieved January 19, 2009. ↑ 71.0 71.1 William J. Adelman; Dave Roediger and Franklin Rosemont, (eds.) Haymarket Scrapbook. chapter "The True Story Behind the Haymarket Police Statue." 167–168. Adelman, William J. 1986. Haymarket Revisited, 2nd edition, Chicago: Illinois Labor History Society. ISBN 0916884031. Bach, Ira J., and Mary Lackritz Gray. 1983. A Guide to Chicago's Public Sculpture. Chicago: University of Chicago Press. ISBN 0226033996. David, Henry  1963. The History of the Haymarket Affair: A Study of the American Social-Revolutionary and Labor Movements, 3rd ed., New York: Collier Books. OCLC 6216264. Dunbar-Ortiz, Roxanne. Blood on the Border: A Memoir of the Contra War. 2005 Cambridge, MA: South End Press, ISBN 0896087417. Fireside, Bryna J. 2002. The Haymarket Square Riot Trial: A Headline Court Case. Berkeley Heights, NJ: Enslow Publishers. ISBN 0766017613. Foner, Philip S., ed. (1969) 1977. The Autobiographies of the Haymarket Martyrs. reprint New York: Monad. ISBN 0873488792. __________. May Day: A Short History of the International Workers' Holiday, 1886-1986. International Publishers; 1st ed. 1986, ISBN 0717806243. Green, James R. 2006. Death in the Haymarket: A Story of Chicago, the First Labor Movement and the Bombing that Divided Gilded Age America. New York: Pantheon Books. ISBN 0375422374. Hucke, Matt, and Ursula Bielski. 1999. Graveyards of Chicago: The People, History, Art, and Lore of Cook County Cemeteries. Chicago: Lake Claremont Press. ISBN 0964242648. Kvaran, Einar Einarsson. Haymarket - A Century Later. (unpublished manuscript). Morn, Frank. 1982. The Eye That Never Sleeps: A History of the Pinkerton National Detective Agency. Bloomington, IN: Indiana University Press. ISBN 0253320860. Riedy, James L. 1979. Chicago Sculpture: Text and Photographs. Urbana, IL: University of Illinois Press. ISBN 0252012550. Roediger, Dave, and Franklin Rosemont, eds. 1986. Haymarket Scrapbook. Chicago: Charles H. Kerr Publishing. ISBN 0882861220. Schaack, Michael J. , Anarchy and Anarchists. A History of the Red Terror and the Social Revolution in America and Europe. 1889. (Communism, Socialism, and Nihilism in Doctrine and in Deed.) The Chicago Haymarket Conspiracy, and the Detection and Trial of the Conspirators. Chicago: F. J. Schulte & Co. OCLC 185637808. Retrieved 2009-01-17. Smith, Carl. 1995. Urban Disorder and the Shape of Belief: The Great Chicago Fire, the Haymarket Bomb, and the Model Town of Pullman. Chicago, IL: University of Chicago Press. ISBN 0226764168. This page was last modified on 11 December 2017, at 21:03.